Veteran of the Paris street art scene and creator of ‘take away’ art, Ariane Pasco tells me how the Nice-Art collective first came into existence and why she continues to take her messages to the streets. As a mother of teenage girls and a teacher of Natural sciences Ariane Pasco is perhaps not the archetypal street artist. Then again, it is an almost impossible task to describe a typical artist in this genre when so many choose to remain anonymous. The street artist is a peculiar breed, a creator that often works using a particular logo or character, but about whom we know very little. Ariane Pasco agreed to meet me and let me get to know what drives the people behind the creations. Ariane Pasco has been creating art in Paris since the mid 1980s. She is a founder member of a collective known as Nice-Art, a group that has had as many as seven members but which today counts just two (the other survivor being Dominique Decobecq). The group works mostly with stencils, often based around recognisible icons. Why did they begin creating in the first place though? "There was certainly something about that era in Paris" she remembers. “When we began in 1986, Paris was totally different” she adds. Her eyes glitter as she tells me about this golden age for street art in the city. "We had complete freedom to do as we liked. The city council supported us and even Jacques Chirac (mayor of Paris at the time) was a fan". 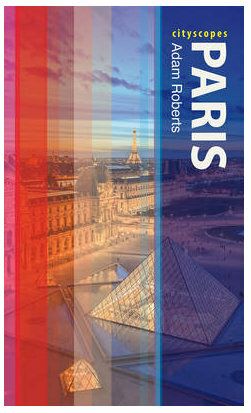 Paris was a city in transition, with some of the older districts around Belleville and Bastille undergoing radical change. These zones, a curious mixture of the demolished and the still standing, became their favoured areas to work in. I ask if there a particular message they wanted to get across, and Pasco shakes her head. "Well, we did do a lot of images of nature at that time because we saw the city becoming more and more concrete, but really we were just having fun". At first they worked almost entirely as a team. Each member had responsibility for one particular colour, enabling them to finish their creations and move on very rapidly. They then created a logo, meaning that team members could then work individually but sign their creations in the name of the group. The styles were similar, but each member was free to choose their own icons. Pasco has always favoured rock stars, whilst others have chosen jazz musicians or famous writers. "One member always created stencils of his girlfriends" smiles Pasco. 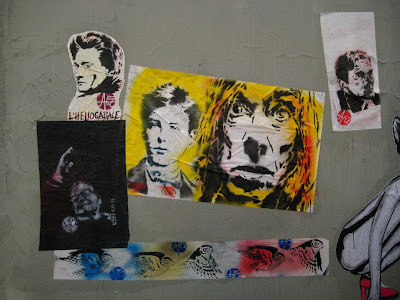 Several other well known artists began working in the city at the same time (Blek le Rat, Miss-Tic, Jef L'Aerosol, Epsilon), and the community was a very close one. They described themselves as the 'gang des mains noires' (black hand gang), and it is interesting to note that almost all still continue today. Miss-Tic is the one who has perhaps had the most success, and I ask Pasco what she thinks about her contract with a van hire firm (Miss-Tic has provided a logo and slogan for this company). She does not hesitate in her reply, "I'm very happy for her and I'm glad that she has so much success today. She struggled a lot, but she has always been someone who has helped others when she can, and she always helped us a lot". Much of Ariane Pasco's work involves nostalgia, but she is far from being a nostalgic person herself. She has always tried new things, and two years ago she began a project for which the collective is now almost best known - take-away art using vinyl discs as support. Where did this idea come from? "I have always loved vinyl. It's the sensation of the material in my hands, but also they fact that they are visually attractive. I was a big collector of vinyl too". She is a fan of rock and retains a passion for the music and the people who create it, and it seemed a natural extension of this for her to work with the material for which the genre is particularly associated. She also wanted to offer something that other people could collect. 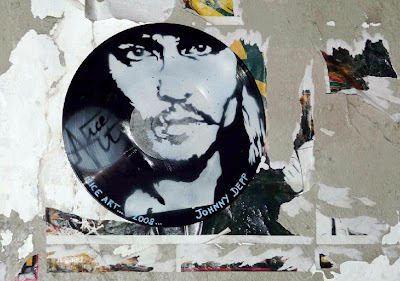 The disc is decorated and stencilled then placed on a wall in a place which is tricky to access. “They are designed to be seen – and taken!” she tells me. Each one is signed and numbered and constitutes a unique work of art. 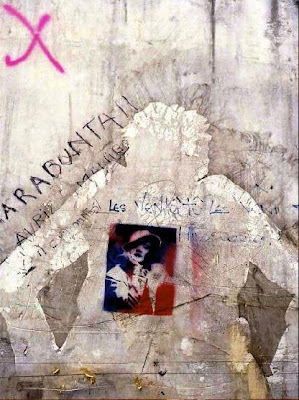 This gives her street art a certain value, she feels, and also means that it lives on when it is removed from its initial environment, something that is very rare in this world. Posters get torn and damaged, but vinyl is sufficiently solid to resist when people pull it down from the wall. The decision to place them in difficult positions was deliberate, because Pasco believes that when people take them it is shows that they really wanted them. She has created and displayed around 400 so far. She shows me her book where each of her creations has been carefully noted, and explains that she is careful not to make too many of each personality. “I’ve done 10 Preverts now” she tells me, “so there’ll be no more of him”. Her chosen icons are not just faces from the past though. 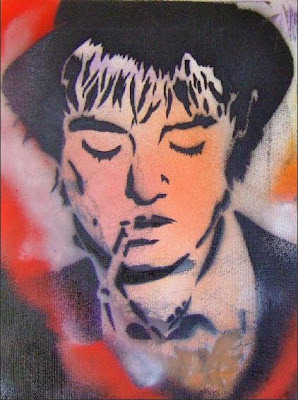 She has recently produced stencils of Pete Doherty, Matt Bellamy from Muse and Alex Kapranos from Franz Ferdinand, with the latter being an interesting case. "We went to Glasgow this summer to place some of our art and I went to a Franz Ferdinand concert. After the show I was able to give him one of the discs with his picture on, and he seemed very happy with it". It is refreshing to meet someone who has not only retained the energy to create, but also the passion of a teenage rock fan! In recent times, Ariane Pasco has also begun making creations on canvas which she sells in galleries. I ask what she thinks about street art in this environment and she frowns. “We have to live” she says, but it is clear that she sees it more as a necessary evil for her. “Street art is spontaneity and energy” she adds, "but in a gallery it just looks flat". She knows that her canvases cannot recreate this, but she understands that people who like the style want something that they can take home with them. Generally such people look for something clean, but she tries to make them as dirty and energetic as possible. As someone who has been involved with the Paris street art scene for nearly 25 years, I'm curious to know what she thinks about the scene in the city today. When I suggest that it seems to me as if there are more street artists than ever working in Paris today she rapidly agrees. "It's a real explosion" she says. "I think it's wonderful" she continues, "there is so much variety today, and there are really no limits to what can be done. I think people have been downtrodden for a long time now, and they really want to express themselves again". Note: Thanks to Ariane for agreeing to meet me and for letting me use some of the photos from her website. If you want to know about her work and that of the Nice-Art collective, visit http://www.nice-art.net/. If you are interested in Street Art and would like to visit some of the key areas in Paris, download my Street Art walking tour. What an excellent way to show us the back scene and the people behind these street artists. I am only hoping they will get the recognition they deserve. Superb Graffiti! Seems like done bye some extremely talented street artists! Thanks for sharing! Quelle chance (que tu as recherchée) d'avoir rencontré une telle artiste et qu'elle t'aie parlé de son oeuvre ! Je trouve quelques ressemblances avec le travail de Warhol dans la mesure où elle se sert de visages connus. 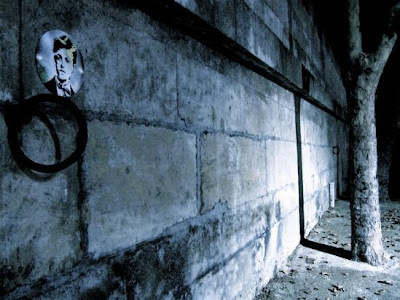 Tes photos sont remarquables, des oeuvres d'art en elles mêmes, surtout celle de la rue sombre et nostalgique à souhait (une merveille de photo) qui ne montre sans doute pas du tout ton vrai caractère, n'est ce pas ? Ah Cergie, la je dois dire que je n'ai pas été bien. En fait, les photos ne sont pas les miennes (sauf la dernière! ), mais viennent du site-web de Nice-Art. I really enjoyed getting all this insight direct from the painter's brush, as it were, or spray can perhaps, in any case, a pleasure to read about the approach of someone who has been doing this for so long... funny, I was a student in Paris for a good part of 1986, and spent many a day out walking and walking, taking in the street art. So this was one of the people responsable... excellent ! Very interesting, well written... a real interview! (How do you get in contact?) She is one of the beginners! (I met some of the later generation in what seems to be their favourite bar, rue Arbalète.) You know that I'm quite interested in this kind of good urban art! Thanks! I'll download it cause street art is the heart of the city. It moves and makes me laugh alone some times.